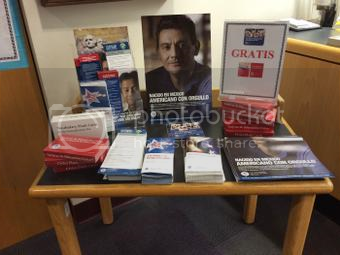 My library is partnering with the Department of Immigration to provide a "Citizenship Corner" with free materials on how to become a U.S. citizen. I helped a gentleman the other day who barely spoke English… he was looking for books on United States history. When I walked him over to the Citizenship Corner and gave him a free set of flashcards on the citizenship exam in Spanish, I thought he might cry with joy he was so happy! What a great feeling, connecting patrons to exactly what they want, even when they aren't sure how to ask for it.